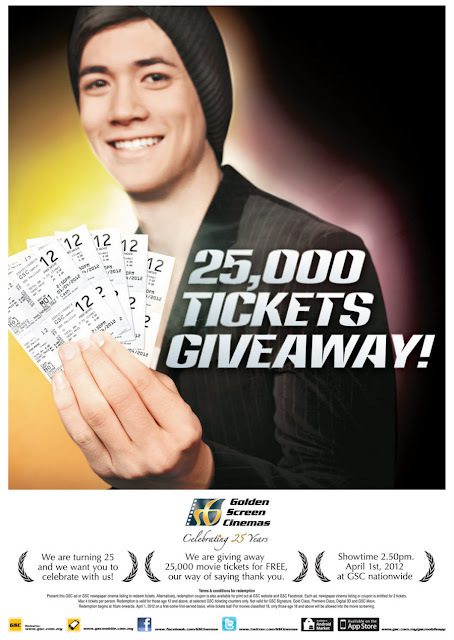 Golden Screen Cinema's 25TH ANNIVERSARY FREE SCREENING : 25,000 Tickets Giveaway! GSC is turning 25 and wants to celebrate with every Malaysian by giving away 25,000 movie tickets for FREE! How to get FREE GSC tickets? Present the GSC ad below or GSC newspaper cinema listing to redeem tickets. Alternatively, redemption coupon is also available for print out at GSC website and GSC Facebook. Each ad, newspaper cinema listing or coupon is entitled for 2 tickets. Max 4 tickets per person. Redemption is valid for those age 12 and above, at selected GSC ticketing counters only. Not valid for GSC Signature, Gold Class, Premiere Class, Digital 3D and GSC Maxx. Hurry, share out this great giveaway with your family and friends!